The peaks of the trendlines are about 5 degrees apart. That is a huge difference, especially considering that our major turf species prefer soil temperatures well under 70 degrees. 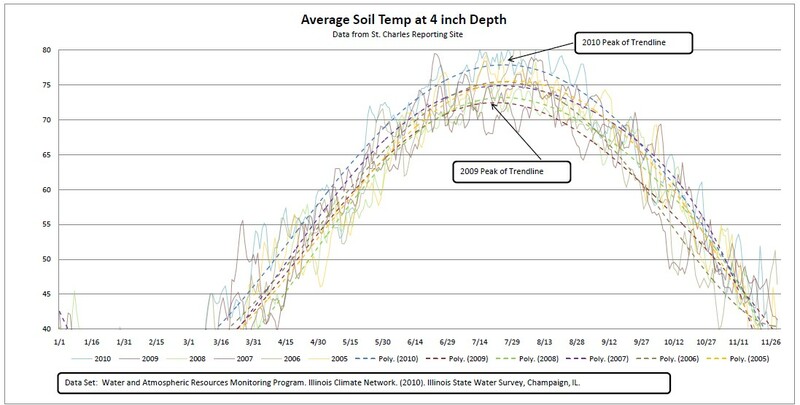 A trend of average soil temperature over 75 degrees is a difficult summer, especially for Poa annua. I fully admit that I produced this chart to put my mind at ease! 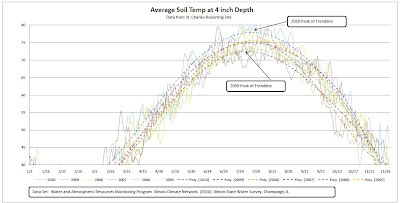 2010 was my second year as a superintendent and I needed some scientific confirmation: Yes, there was something very different about 2010 -- and it doesn't happen every year. The take-away message of 2010 for me: Superintendents have to work to make improvements during those "easier" years to get as much turf as possible through those tough years.